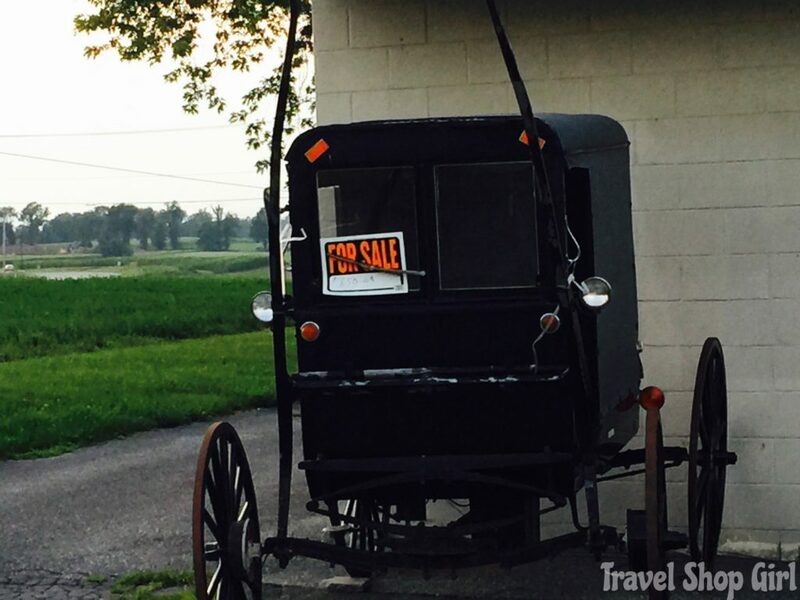 After leaving Philadelphia, Danielle and I took our white Mustang convertible (aka “Big Ang”) back on the road for the 90 minute drive to Lancaster, Pennsylvania and Amish country. 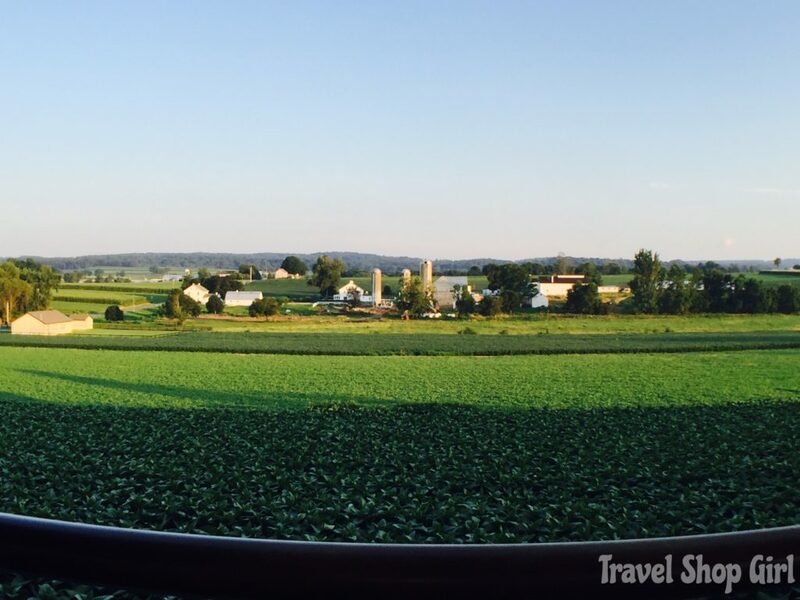 As we continued on our Two Chicks and A Road Trip adventure throughout the Northeast United States, it seemed only natural to drive to Lancaster County home of the Amish, pretzels, and more. If you’ve never visited and think Amish country is only what you see on television, you’re completely mistaken. 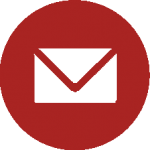 Life is simpler in Lancaster and that will make you slow down, enjoy your surroundings, take in a home cooked meal, and discover what makes this area so unique. On our first day in Lancaster it’s all about food, covered bridges, trains, and our unique Lancaster hotel. First things first — food. 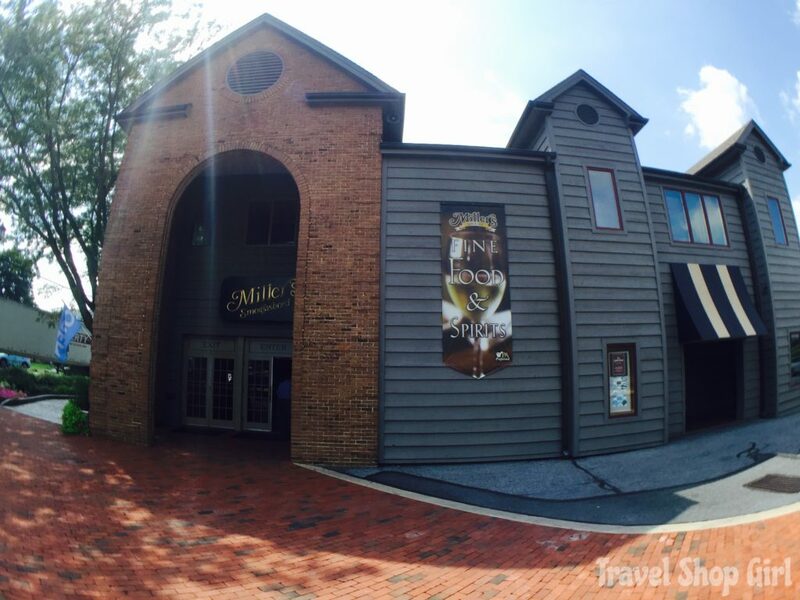 We had heard great things about Miller’s Smorgasbord and we definitely wanted to experience it for ourselves. This isn’t your typical buffet with the same old, same old tired choices. This is locally sourced fresh food made from scratch with more food choices available than you could ever dream up. While you can visit Miller’s Smorgasbord for breakfast, lunch, or dinner we were there for lunch. The traditional smorgasbord dinner ($23.95 per person) begins with soup like their Seafood Bisque or Creamy Potato; salad, and bread. Move onto appetizers like shrimp (plain, seasoned, and ginger), sauteed mushrooms, and Swedish meatballs. Still hungry? Entrees include baked ham, fried chicken, chicken pot pie, and the list goes on and on. Don’t forget about dessert, too, although I was so full I could barely move from the table. As a vegetarian I was concerned that they wouldn’t have anything for me, but they had salads and vegetables galore and even vegetarian chili. No matter what you choose, you’ll enjoy the abundance of freshly cooked food, baked goods, and so much more from Lancaster’s original buffet restaurant that first opened in 1929. 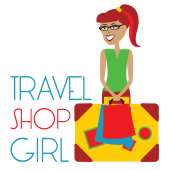 TSG Tip: Check out the coupons page on their website to save money on your meal, shopping, and area attractions. Thinking about doing a little shopping or maybe enjoying a slice of Shoofly pie? Wait you don’t know what Shoofly pie is? 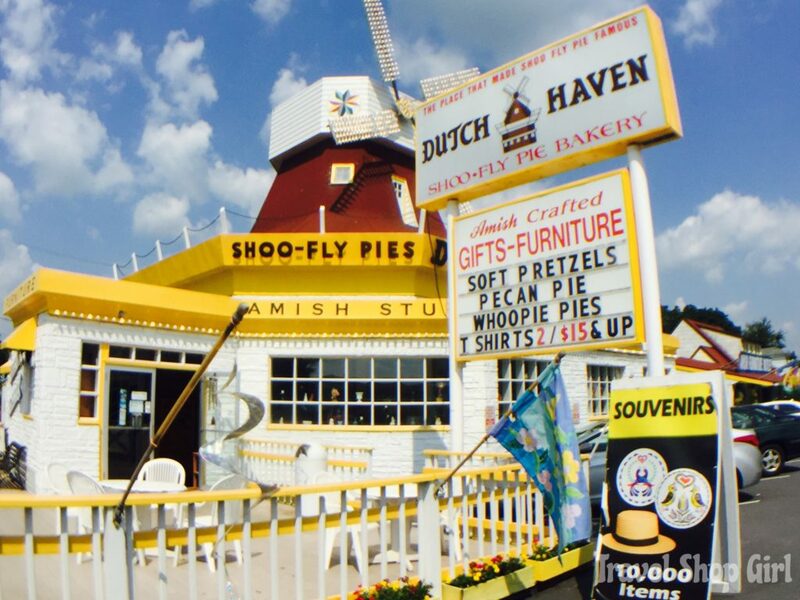 Dutch Haven says they have America’s best shoofly pie, a molasses (treacle for those of you in the UK) pie that’s topped with crumbs and is delicious. You won’t miss the bright yellow and white building with a windmill on top where you can easily spend hours shopping. But be sure to bring your wallet to Dutch Haven as they have thousands of items from which to choose. You’ll find t-shirts, dolls, penny candy, baked goods and everything in between. Dutch Haven is a definite must for any shoppers headed to Lancaster. Danielle and I both wanted to check out a few of the covered bridges while in Lancaster. There used to be about 14,000 in the United States, but now there are less than 900. Even though I grew up in New York, I don’t think I’ve ever seen a covered bridge. We chose two to scout out and the first was Siegrist’s Mill Bridge. This picture perfect bridge is honestly what I would expect to see in a painting or a postcard. It measures 102 feet in length and was constructed in 1885. 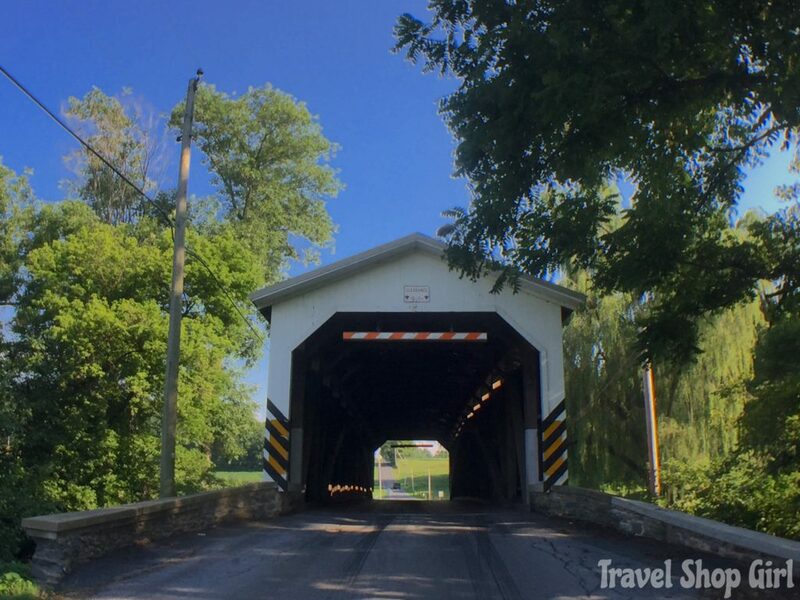 Like all Lancaster County covered bridges, its exterior is traditional red with classic white entrances. 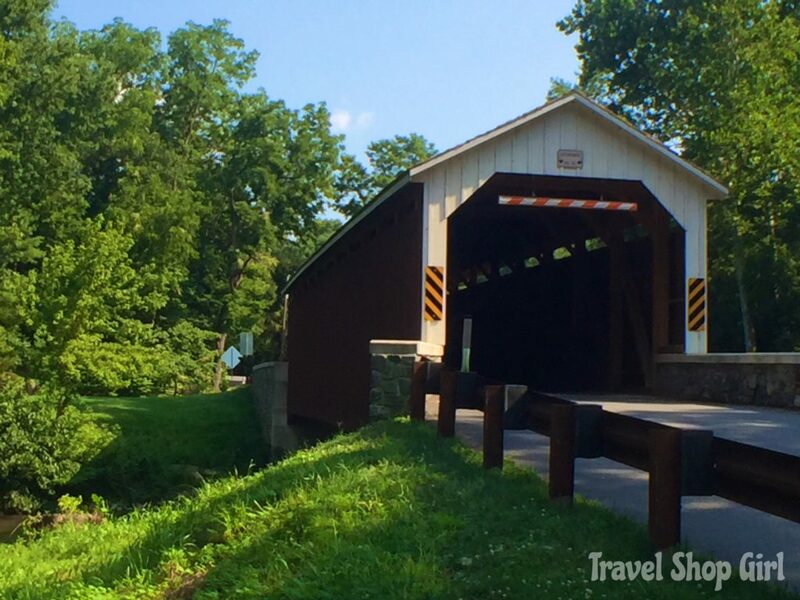 TSG Tip: Did you know that there are over 25 covered bridges in Pennsylvania Dutch Country and that there are more covered bridges in Pennsylvania than anywhere else in the country? Another covered bridge we visited was Strasburg Bridge, which also goes by the name of Lime Valley Covered Bridge. It was built in 1871, is 103 feet long, and is also painted the traditional red with a white entrance. It was known as the twin bridge as another covered bridge once sat 200 feet west of this bridge. This covered bridge sits near a large, billowy willow tree and on the day we visited, the sky was remarkably blue. Not one to take loads of selfies, I couldn’t help myself in front of this bridge. Partial selfie, partial bridge or a bridge selfie perhaps? On the way to our hotel, we passed many fields of corn and I kept trying to convince Danielle to go inside one and take a picture. She was certain that there were spiders inside and didn’t want to go. I pulled over near one, jumped out to take a picture, and then got kind of creeped out at the thought of spiders and who knows what else was in there? 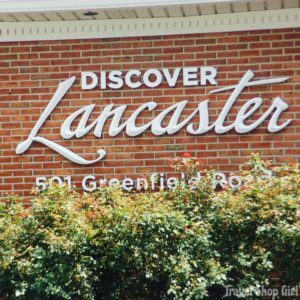 When it was time to check into our hotel, we drove into downtown Lancaster and the Lancaster Arts Hotel. 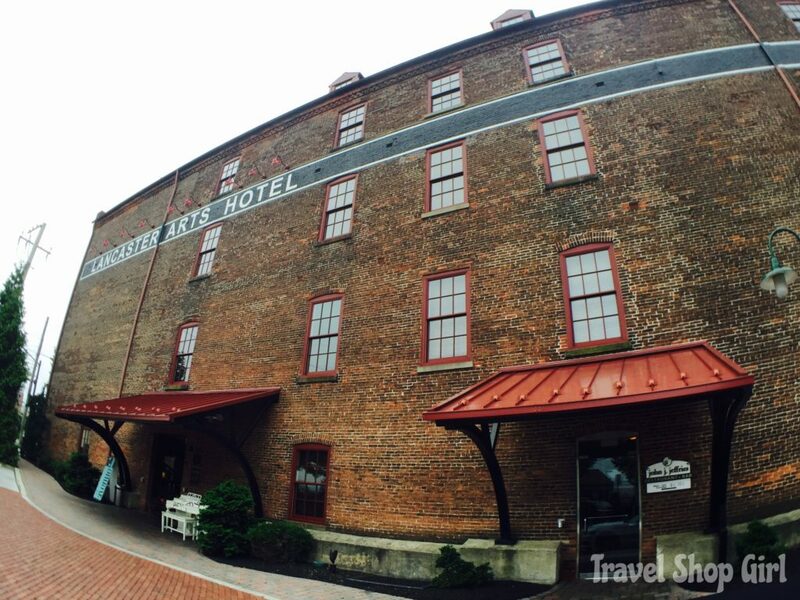 This 63 room, 12 suite hotel in a converted warehouse built in 1881 is filled with original works of art. The result is that you’ll feel like you’re staying in a carefully curated gallery and not a cookie cutter hotel. 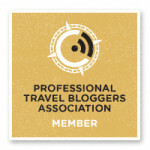 No wonder it’s a member of Historic Hotels of America. The collection of artwork of 269 pieces by 36 artists inside the hotel can be found not only in public spaces, but also inside guest rooms and is valued at over $300,000. 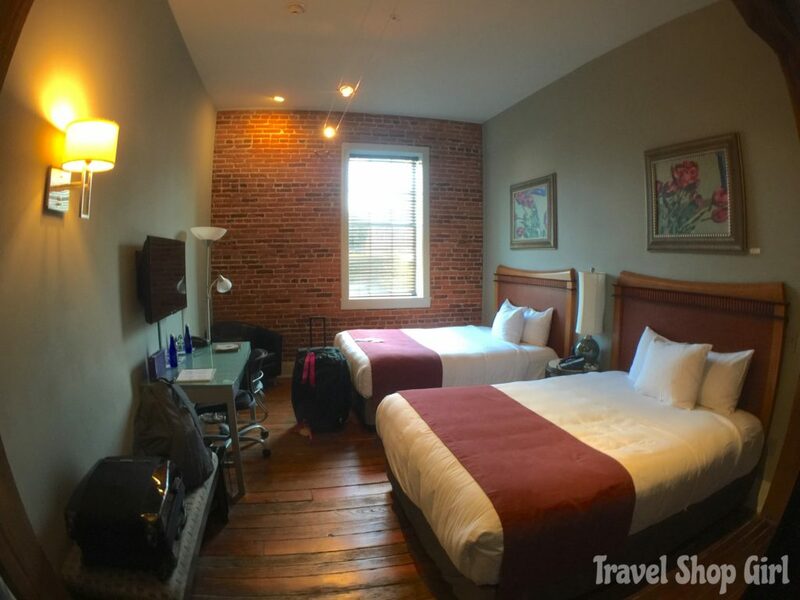 The design of the hotel is one where they carefully preserved the rich history of the former tobacco warehouse all while incorporating modern touches. Guests will appreciate the wide plank hardwood floors and exposed brick in addition to countless pieces of artwork. Guestrooms are super comfy like our room 211 with high thread count Egyptian sheets, iPod docking stations, and HD flat screen TV. 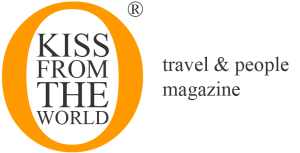 Amenities to guests include a variety of complimentary items like wireless internet, deluxe continental breakfast, Saratoga bottled water, and Tarocco toiletries in the modern and spacious bathroom. If you love art and want to experience a hotel like nothing you’ve ever seen before in your life, plan a visit to Lancaster and the Lancaster Arts Hotel. After we dropped our bags off at the hotel, we jumped back in our convertible so we could get onboard Strasburg Rail Road. 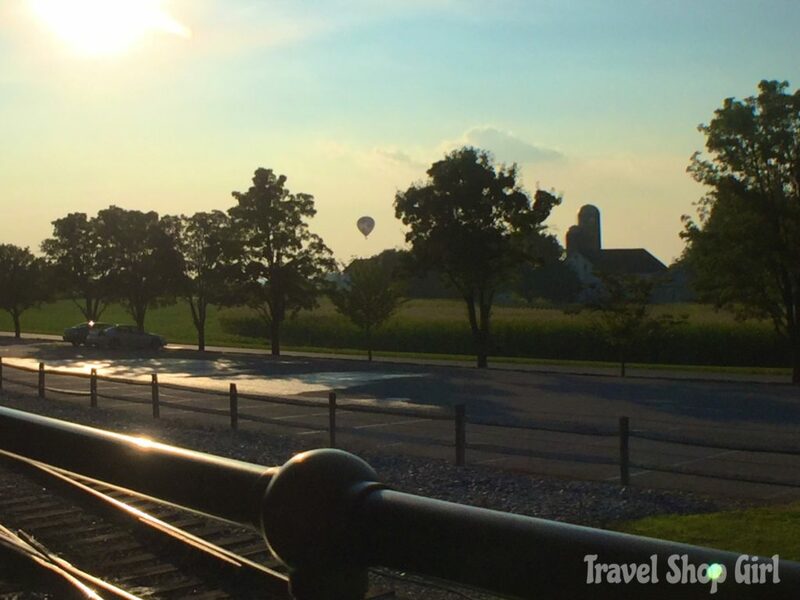 Take a 45-minute round trip ride through the Amish countryside on a real old fashioned train pulled by a steam locomotive. The old time railroad station ticket booth will immediately transport you back in time. Strasburg Rail Road offers multiple classes of service to accommodate everyone. Once your receive your ticket, take a really close look at it. That’s right, it says “Games of chance permitted only in baggage car” and “All male passengers must assist crew in shoveling snow or pushing if necessary” as well as a few others that are worth a good laugh. While you might assume the upper class seats are best for this scenic trip, I’d beg to differ. Danielle made the best call by choosing the open air car, perfect for taking pictures on a warm summer night. The view from our train included looking over the many fields in this area. 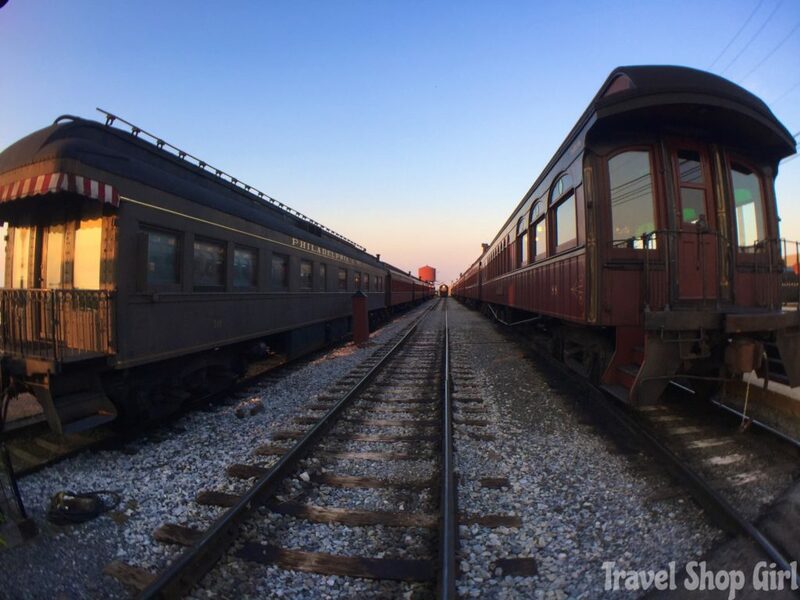 The Strasburg Rail Road train travels the same 4 1/2 mile track it has traveled on since 1832. The train gets to the end of the line and then the locomotive gets unhooked and moves to the opposite end of the train for the ride back to the station. If you’re looking for a fun activity for your family, this is one that is guaranteed to please kids of all ages. 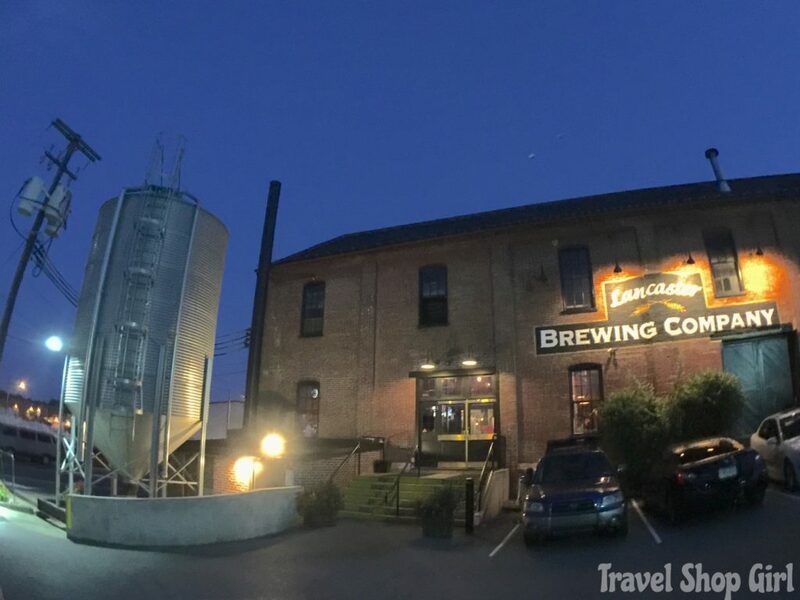 After our train ride we were hungry and drove over to the Lancaster Brewing Company, the first brewery doing business in Lancaster since 1956. It opened in 1995 in the historic Edward McGovern Tobacco Warehouse, which is gigantic and as unique as the menu they offer. Dine inside or outside on the patio like we did on this warm summer evening. After ordering a cocktail, I was recalling my time with Martin in Atlantic City and ordered yet another pretzel as a starter. This is the Philly Pretzel Twist and Fondue ($5), which was huge and tasty. For an entree the Greek Salad ($7) was loaded with feta cheese and great veggies and kalamata olives. Yum! You’d never be able to find these prices in a city so I enjoyed eating my meal with seriously old school prices. After my day here, I was settling in and thinking I could be like Harrison Ford in “Witness” and slide right into the Amish lifestyle. Did anyone other than me ever see that movie? While that’s not going to happen any time soon, I certainly had an enjoyable time experiencing the food, activities, and the people in Pennsylvania Dutch Country while discovering Lancaster. On day seven we spend the morning in Lancaster before leaving for New York. Check out the many pics of our trip by reading all of the road trip posts and also searching the hashtag, #TwoChicksAndARoadTrip on Twitter, Instagram, and FaceBook. While I was generously provided discounted accommodations by Lancaster Arts Hotel, complimentary admission on the Strasburg Rail Road, and complimentary meals at Miller’s Smorgasbord and Lancaster Brewing Company courtesy of Discover Lancaster, all opinions and photographs, unless otherwise noted, are my own. 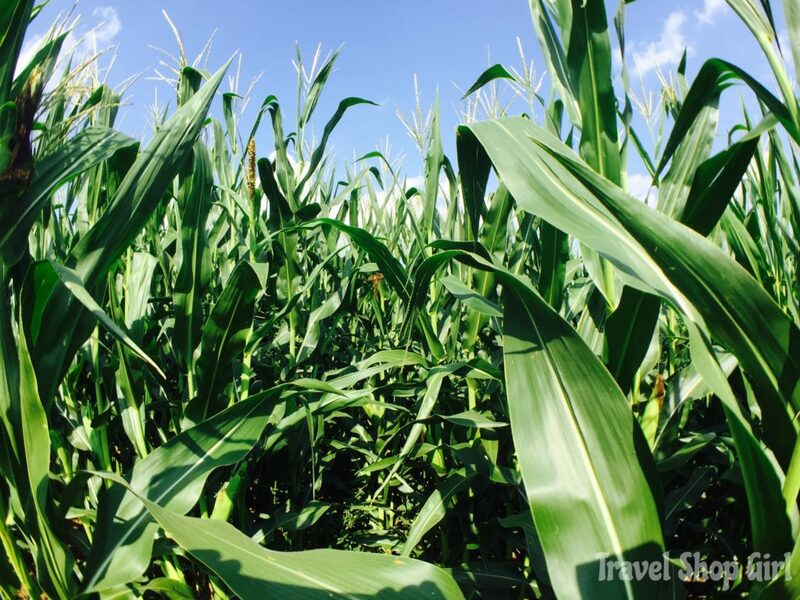 What 12 Things Did I Do in Amish Country?